Sunday Times Travel Book of the Year, 2009. Nominated for India’s Ramnath Goenka’s Excellence in Journalism Best Book Award. Edna is a British writer of Indian origin. She was born and spent her early years in Nairobi, Kenya before moving to London where she grew up. Her first book Holy Warriors was a finalist for the UK’s 2008 Index on Censorship TR Fyvel prize and nominated for India’s Ramnath Goenka Excellence in Journalism Best Book Award. 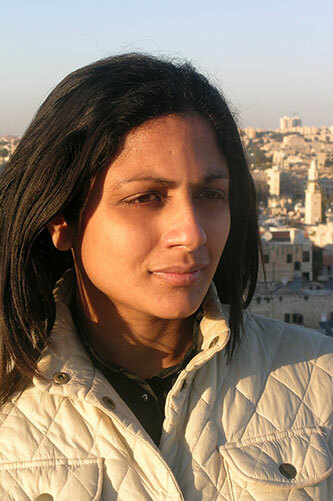 Her second book, The Last Jews of Kerala, was a finalist for India’s 2009 Vodafone Crossword Literary prize and named a UK Sunday Times Travel Book of the Year. In 2018, Edna released her third book, The Hollow Kingdom: ISIS and the Cult of Jihad. Aimed at the general reader wishing to understand the most dangerous terrorist group in modern history, the book deconstructs Islamic State’s ideology, funding and recruitment structure. She is former Special Correspondent for Britain’s Mail on Sunday, former foreign correspondent for the Financial Times and UK political correspondent for Reuters. She has appeared as a commentator on religious extremism and terrorism on BBC News, Channel 4 News and Sky as well as speaking at international literary festivals including the Delhi Literary Festival, Edinburgh Festival, Index on Censorship Freedom of Expression conference in Oslo, Jewish Book Week in London, Cumberland Lodge in Windsor and the Cheltenham Literary Festival. Edna is co-founder of Beyond Conflict, an international charity launched in January 2018 to provide free psychological counselling to refugees suffering acute trauma in war-zones, starting with Iraq. www.beyond-conflict.co.uk.